Muscle relaxing wrinkle injections are one of the most common injectable treatments at our Sydney clinic. These injectables can be used on many areas of the face, including eye wrinkles, frown lines, forehead lines and for brow lifting and also face slimming. Unfortunately due to Australian regulations, we are not allowed to name the drugs used. Often when patients reach their mid to late twenties and thirties, they start noticing lines forming around their eyes and forehead. Sometimes others will say things to them like, “you look tired” or “are you feeling OK?” . The great news is that there is a simple solution to preventing and maintaining a youthful appearance using wrinkle injections. The muscle relaxing injections are injected using a fine needle into the facial muscles and it blocks the message from the nerve to the muscle, reducing the amount of contraction of that muscle causing reduced appearance of lines. Please see the following research on safety and efficacy on wrinkle injections. Most patients choose to have retreatment at 3-4 months, however this varies between patients. Males, exercisers and those who are more muscular, may tend to require larger doses and more frequent doses. Wrinkles injections are a medical treatment prescribed by a doctor and have risks associated. In terms of non-surgical cosmetic treatments, wrinkle injections are generally considered to be the lowest risk procedures. Headache post injection 10%, mild, usually lasts 24hrs or less. Eyebrow/eyelid droops in 2% of cases. Minor and temporary. Could last 3 weeks. Blurred vision. Temporary. Extremely rare. What areas are suitable for treatment with wrinkle injections? What is the satisfaction rate for wrinkle injections? The satisfaction rate is very high and the retention rate ie those who want to continue treatment after trying the procedure once, is also very high. Is the injectable procedure painful? The pain is minimal. 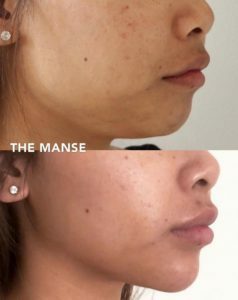 At The Manse, we offer numbing cream, ice and happy gas to our patients for their ant wrinkle injections. Most patients just choose an ice pack. The procedure itself takes about 5 minutes, but at your appointment you will need to take photos and sign a consent form and also be cleaned. Patients can expect to be at the clinic for about 30 minutes if the doctor is running on time. What it the price of anti wrinkle injections? The price starts at $300, but a typical spend would be around $650-$700. Please see our prices page for detailed pricing for antiwrinkle injections. 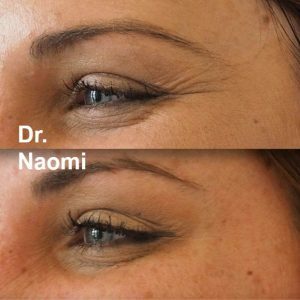 Can you share some before and after images of wrinkle injections? To maintain your results you will be recommended regular treatments. It’s out protocol to not review results before 4 weeks, as results will often increase up to that time, and sometimes results on one side will sick in before the other, and then the other side will catch up. We need to review the results at their maximal effect. If we retreat too early, we may not be choosing the correct dose or placement. 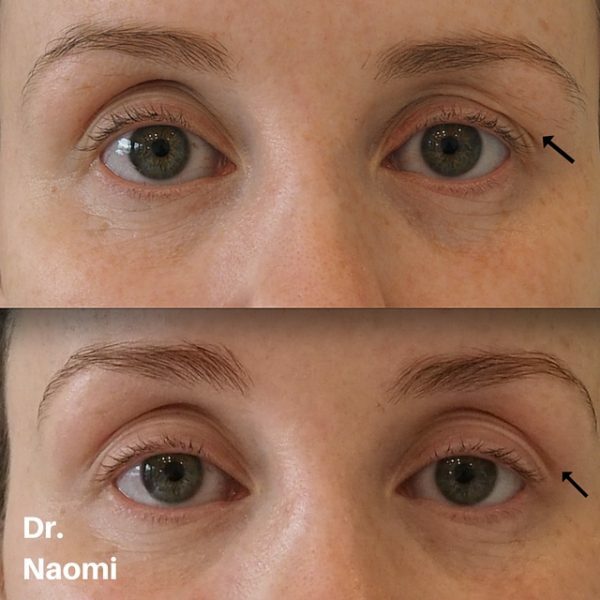 We do not want to increase our risk of a lid or brow droop or asymmetry.